If you’re like me, you must have noticed that more people are choosing not to eat animal products and cake decorating is no exception. Although I doubt anyone would eat gum paste flowers, they may touch the cake so making sure they are vegan is important. By removing gelatin and eggs and replacing them with ingredients such as aquafaba and agar-agar you can produce a vegan version of the traditional gum paste recipe. Also, the majority of sugar available in stores is not vegan so you must be aware of this when buying ingredients. No, conventional sugar gum paste is not vegan. It is made with gelatine which is made from animal by-products, and it also contains egg whites. It can be colored with food dye that may be derived from animal products, and even some sugar is not vegan. If you want gum paste that is animal-free then if you buy ready-made paste or powder that has to be mixed into a paste, make sure there are no animal products in it. The best way to make sure it is vegan is to make your own. Gelatine is made from collagen which obtained by processing the connective tissue, skins, and bones of pigs and cows. It comes as a colorless and flavorless dry powder or in small transparent sheets which you soak in water before using it. Apart from being used in gum paste, it is used to make rolling fondant, marshmallows, ice cream, yogurts, cosmetics, medicines, and many more things; in fact, the list is endless. Fortunately, there is a vegan product you can replace it with. If you want to live your life without harming or killing animals, then there is usually a plant-based way to do it and making cakes and decorating them is no exception. Some of the things you make with the alternative ingredients may not perform in quite the same way that animal-based products perform, but like anything, once you get used to using them, you will not notice any difference. The vegan replacement for gelatine is a product called agar-agar. It is made from seaweed, it’s tasteless and colorless and comes in dried strips, flakes or powdered form. If you have never used agar-agar before then, at first, it is advisable to follow a recipe specially developed for it before you are tempted to create your own recipe. Agar-Agar and gelatine both solidify liquid to a jelly-like state but the textures are not quite the same. Agar-Agar is more powerful than gelatine, so that is why it is advisable to follow a recipe. Agar-agar is not very expensive and I know you can buy it from Amazon and I am fairly sure a shop in your area will stock it. Now we need to focus on replacing the egg in gum paste so what can you use? Several egg replacers on the market can be used in baking, but most of them replace the whole egg which is not required for making gum paste. The best replacement for egg white that has been taking the vegan world by storm is made with the water that comes from a can of chickpeas, and it is called Aquafaba. You can boil some chickpeas yourself in some salt-free water to use, but if it is not thick enough, you may have to reduce the liquid until it is the right consistency. However, if you are a vegan I am sure you use many tins of chickpeas so instead of throwing the liquid away freeze it until you need to use it. Two tablespoons of Aquafaba are equivalent to one egg white. Use an ice tray that has sections that will hold two tablespoons of the liquid, freeze it then tip the frozen pieces into a freezer bag to use as required. Once thawed it will whip just the same as if it was fresh. The smell of the liquid is not very pleasant when you first open the tin, but the smell soon goes after it has been in the fresh air and it has no taste. Did you know that cane sugar is not always vegan? I have mentioned in other articles that I prefer to use cane sugar for making gum paste flowers because the paste is more pliable and makes better flowers. It is not always stated on the sugar bags if its beet sugar or cane sugar but as soon as I start working with it I can tell which it is. Some producers mix both types together which doesn’t help. 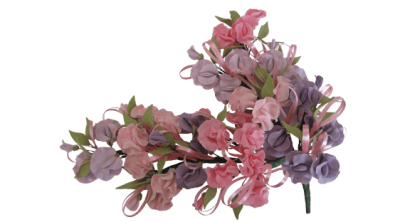 I am not saying you can’t make flowers with beet sugar, it is just a personal preference, and once you start making flowers yourself, you will get your personal preferences. I recently discovered something I never knew before, and I was quite shocked. I read an article about processing cane sugar and apparently, most of it is filtered through beef bone char to take out the impurities and whiten it. It does not have any bone left in it by the time it reaches the consumer but a vegan would not be pleased to know their sugar has been touched by animal remains. 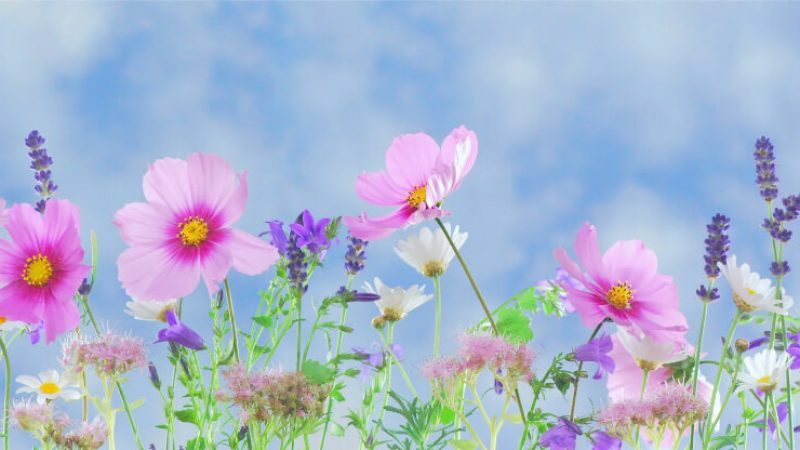 If you need vegan ingredients, you may think this rules out using cane sugar for flower making, but I have also discovered that there are producers who won’t use bone char and process their cane sugar using vegan-friendly methods and their packets of sugar are labeled vegan. You must think that it is the end of making gum paste vegan-friendly but there is one other ingredient to consider and that is food coloring. I remember being told at school that a lot of red food coloring is made using cochineal (sometimes known as carmine) that is created by crushing insects. I have no doubt that I was horrified at the time but the information never really stayed in my mind, and I never thought of it again until I started cake decorating, and it was only then that I looked around for plant-based red food coloring gel. I must have eaten it for years in any pink or red-colored food, but once I thought about it, I couldn’t believe that I had been eating squashed insects. 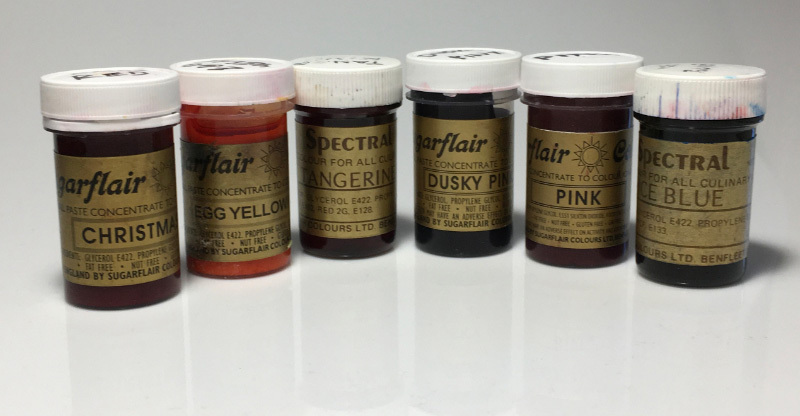 Sugarflair – gel pastes and dust are vegan-friendly except for Fairy Dust Pink and Purple Sparkle from their Luster Dust range, and they contain carmine. Chefmaster – make a range of vegan-friendly gel paste that is derived from plants. Wilton – also make vegan-friendly gel paste and a considerable range of other coloring products. AmeriColor – have no animal products in their colors. There are many more, but those are the four leading manufacturers of coloring agents for cake decorating, but I have no doubt there are many more, and it’s easy to find out if they are vegan-friendly. Now we have discussed the various alternative ingredients for vegan gum paste we need to get on and make some. 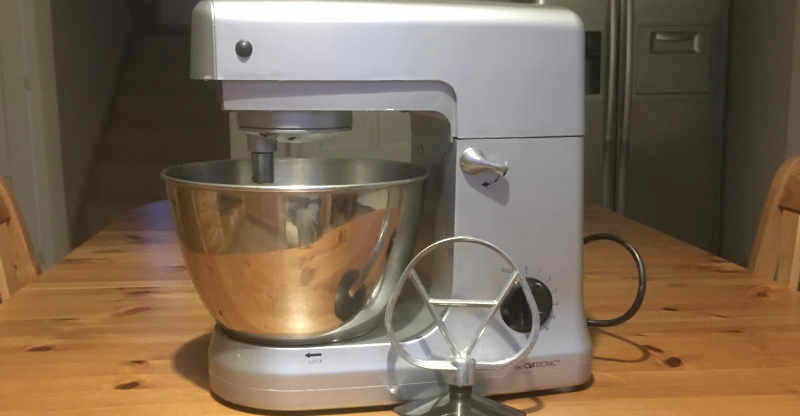 Ideally, it is best to make it using a tabletop mixer because a hand mixer is not strong enough to mix the paste. Place the cold water in a heatproof bowl (that will fit over a saucepan) and stir while sprinkling in the agar-agar then let it stand for half an hour. While the agar-agar is soaking, sift together gum tragacanth and confectioners’ sugar into a clean, heatproof bowl (or into your mixer bowl if it is heatproof) and warm it over a saucepan of gently, simmering water for about 5 minutes. Stir it carefully after a couple of minutes to make sure it’s warm right through. Next, dissolve the agar-agar, in a heatproof bowl, over a saucepan of simmering water and stir until it has completely melted. Add the liquid glucose and white fat, mix and make sure it has also dissolved being careful not to overheat, then remove from the heat and leave it to cool for a couple of minutes. Warm your mixer bowl – If you have not used your mixer bowl to warm the confectioners/powdered sugar and gum tragacanth then warm it by putting some hot water in it for a few minutes, then empty and dry then add the sugar and gum tragacanth. Add the agar-agar, liquid glucose and vegetable fat mixture and aquafaba to the confectioners/powdered sugar. Set the electric mixer on a slow speed and mix everything together. Turn up the speed to maximum when everything is combined, and beat for between 3 – 5 minutes, the paste should be quite stiff and the longer you beat the paste, the whiter it will be. After you have finished beating the paste, take it out of the mixer bowl and divide into six pieces and double wrap tightly in plastic, place them in an airtight plastic box and leave it overnight at room temperature. When you are ready to use the Gum Paste knead it until it is soft enough to use and keep any you are not working with tightly wrapped until required. Store the Gum Paste – If you are not going to use the paste straight away, it can be left for several days at room temperature. However, after you have made the paste if you are not going to use it for any length of time, double wrap it and place in an airtight plastic, freezer proof box, leave it overnight at room temperature then put it in the freezer where it will keep for several months. To use the Gum Paste – To use Gum Paste that has been in the freezer leave it to defrost at room temperature then knead it until it is soft and pliable. Note: If the Gum Paste too hard to knead then you can put it in the microwave for a FEW SECONDS at a time until it is warm enough to knead. Leave it any longer then it will melt and the sugar content will burn your hands and, because it will have been overheated, it will most likely be unusable. I am sure you realize now that it’s not difficult to make vegan gum paste. When replacing animal-based ingredient in sugar gum paste with the vegan alternatives, it is essential to choose a product that will give you similar results. I think this has been achieved with the ones I have talked about in this article. Gelatine – replaced with agar-agar which can be bought at your local health shop, cake suppliers or from Amazon. Food dyes – available from most cake suppliers or Amazon. I have also given you a recipe for sugar gum paste using the alternative ingredients.